Maps are becoming increasingly popular in apps as time goes on. You can see maps in all kinds of apps, from Uber to Instagram to my new app, peek. Although maps are common, adding more complex features to them can be a challenging process. In this tutorial, we’re going to talk about annotations and shape rendering in MapKit, Apple’s map library for iOS. Many of the maps you see on iOS are powered by MapKit, including the map in Apple’s own Maps app! 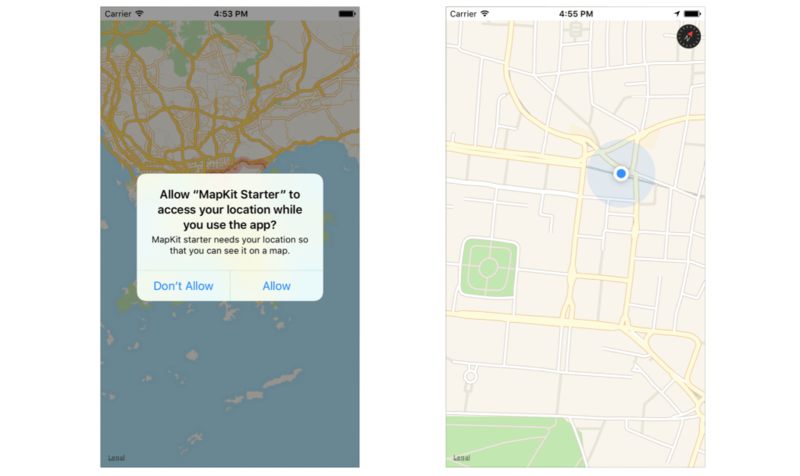 MapKit is a powerful, tried and tested mapping library. It’s also really easy to use, so let’s get started! Places.plist: This is a property list file that stores the places we will be rendering. Places.swift: This Swift file loads the places in Places.plist and exposes them to the rest of our Swift code. Main.storyboard: This is the main storyboard our app uses. If you look into the storyboard, it has a view controller with a map view. I have already set up the UI and auto layout for you. 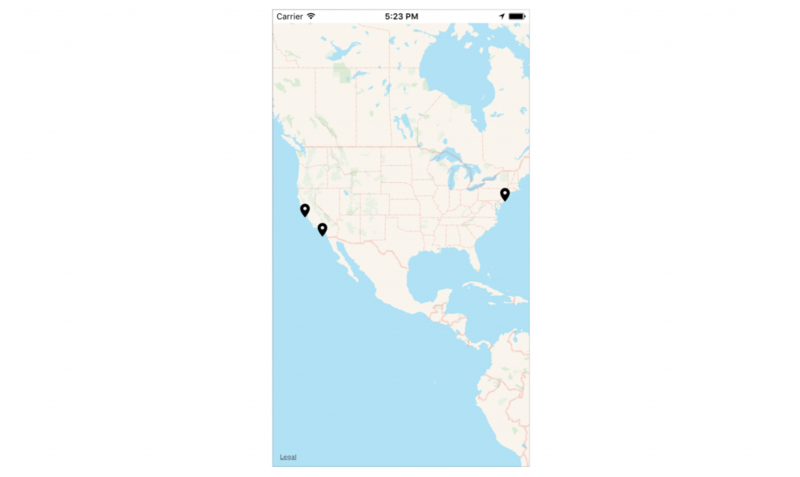 ViewController.swift: This is the view controller that our app will use to control the map. I have already created an outlet that connects with the map view in the storyboard. Click the plus icon and add MapKit.framework. Do the same in Embedded Binaries if Xcode doesn’t add it for you automatically. Alternatively, you can go to the Capabilities tab and switch the Maps option to ON. Now we’re ready to go! Build and run the app and see what happens! You should see an MKMapView taking up the whole screen. By default, this map view supports zooming, rotating, scrolling, and 3D mode. It also shows points of interest where applicable and displays buildings in 3D in major cities. Cool stuff! We’re going to be working with this map in our tutorial, so grab some coffee, sit down, and let’s get to work! We need to take a few more steps before this works. Currently, MapKit will try to display the user’s location, but we haven’t requested location access from the user yet! Let’s fix that. This function has a simple task: it checks the current status of location authorization and then acts accordingly. If the user has already authorized the use of his or her location, it returns, as nothing needs to be done. If location access is denied or restricted, this function prints an error message. Otherwise, we request access to the user’s location when the app is in use. One last thing! Head over to Info.plist. We will add a key called NSLocationWhenInUseUsageDescription of type String. Set the following value for this key: “MapKit starter needs your location so that you can see it on a map.” This will tell the user why we are requesting their location, which makes it more likely that they will accept. As of version 8, iOS also requires that we provide this string. 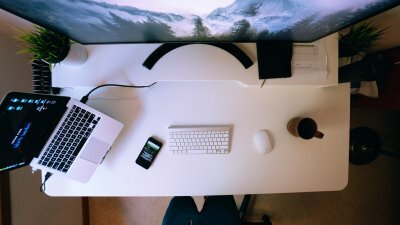 Build and run the app again. 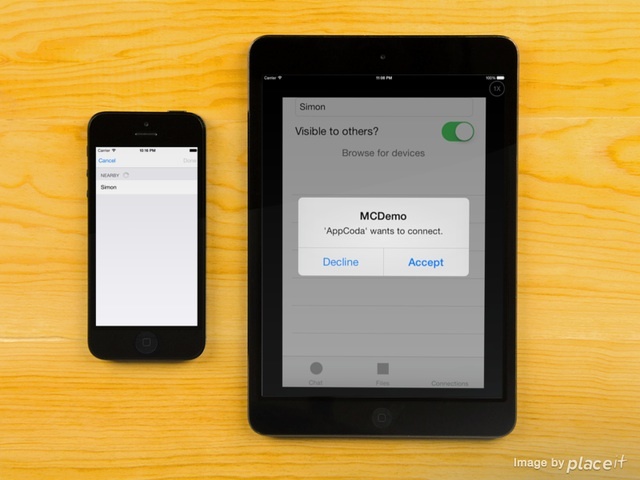 You should get a prompt asking for access to your location. Press accept, and voila. We can now display the user’s location. 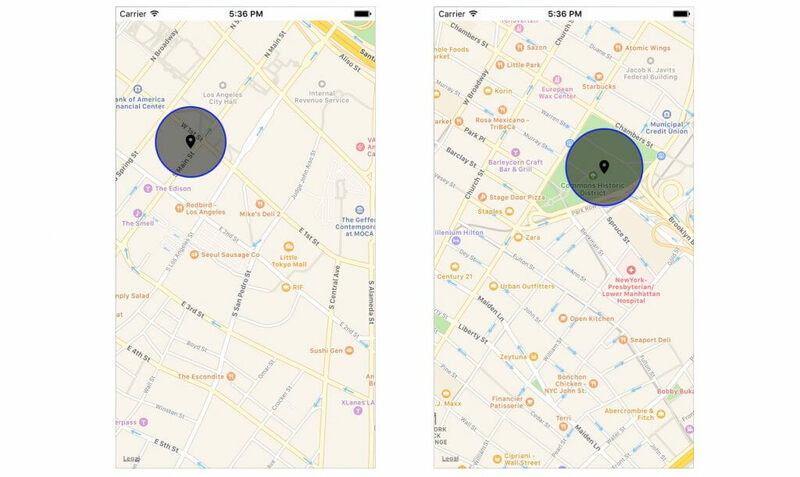 MapKit will automatically update this location as the user moves around. If you use the simulator to test the app, you can click the location button in the debug area. 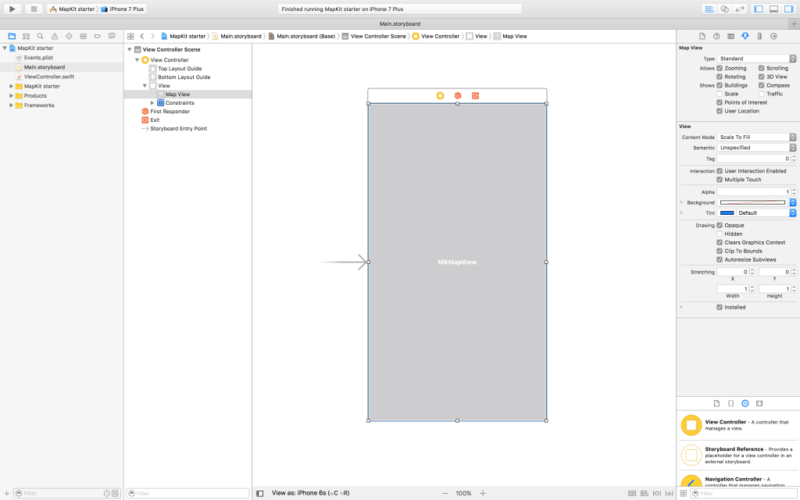 Xcode provides a list of locations for you to simulate the user’s location. Now, let’s look into displaying some more exciting content. We learned how to display the user’s location already, but now, let’s display a custom annotation with our own image. Open Places.plist and take a look at what’s inside. You should see a brief list of cities. Since this is only for the sake of an example, we kept the list rather short. The list has New York, San Francisco, and Los Angeles, along with their latitudes and longitudes. Although property lists are out of the scope of this tutorial, you should check out this tutorial if you want to read more about .plist files. Create an object that conforms to the MKAnnotation protocol, or extend an existing one. Create an object that conforms to MKMapViewDelegate and assign that delegate to our map view. Add an implementation for mapView(_: viewFor:) to provide MapKit with the view to render for any given annotation. We’re going to implement this in the 4 unique steps described above. To use the MKAnnotation protocol, you adopt it in any custom objects that store or represent annotation data. Each object then serves as the source of information about a single map annotation and provides critical information, such as the annotation’s location on the map. Build and run and…nothing? That’s right. Nothing! Conveniently, our Place class already has all the requirements of MKAnnotation. Cool. Let’s move onto to the next step. This isn’t too complex. We set our map view’s delegate to self. Next, we add our place annotations to our map view. Easy! Just make sure to add a call to addAnnotations() in your viewDidLoad() before proceeding. Easy, right? First, we check whether or not the annotation being displayed is the user’s location. If it is, we don’t return our custom annotation, as we want the map to display the user’s location as usual. If it’s not, however, we create a new annotation by dequeuing it. This allows us to reuse annotation views efficiently. Then, we set the annotation view’s image (the image we’re using is in Assets.xcassets). Finally, we return the annotation view. If you run the app, you should find three annotations on the map that correspond to the locations specified the Place.plist file. If you’re lost, please go back and check if you missed something. Feel free to comment below if you need help. So far, we learned how to properly add annotations to an MKMapView. We do this with peek to show users where events are located. Most apps that use maps use this technique so that they can show users specific locations. Now let’s see how to add some shape rendering. Add overlays to our map. Specify renderers for each overlay so that MapKit knows how to render the overlays. The first two lines should look familiar, but the last two lines of code are totally new. We start by using map, one of Swift’s collection manipulation functions, to generate an array of MKCircle objects based on our places. If you’re new to map, this is equivalent to writing a for loop. But you can do it in a single line of code. Next, we add the overlays using mapView?.addOverlays(_:). This is very similar to adding annotations. As the name specifies, this function allows us to return an MKOverlayRenderer to use for each of our overlays with an appropriate renderer. MapKit has a class for rendering circles, it’s called MKCircleRenderer. We create one of these renderers and configure it to match the appearance we want and then we return the renderer so that MapKit knows to use it. 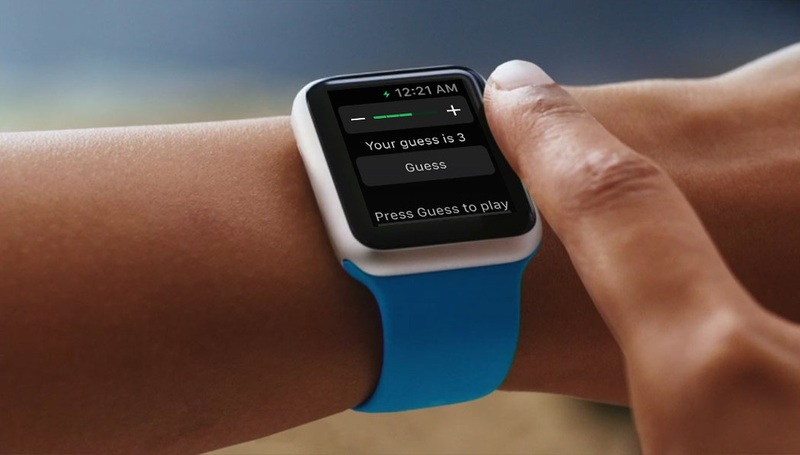 Now you’re ready to test your app again. Zoom into New York, San Francisco, or Los Angeles. You will see the circular overlay. We learned a lot about annotations and shape rendering in this tutorial. Armed with the knowledge you gained, you should be able to make apps that have beautiful maps in them! Feel free to comment if you have any questions. For reference, you can download the Xcode project on GitHub. A high school student who loves to make apps during spare time, and really enjoy teaching people how to create apps. When he is not making apps, he love to ski, play golf, soccer, and spend time with my friends.